Richard Anderson, the current president of Amtrak, is a disaster. He should be removed from his position as rapidly as possible, and then we must be careful to assure that his replacement isn’t as bad as he is. This does not say that I think Anderson or his replacement will be successful at killing trains, although Anderson might sneak one or two small personal victories past Congress when no one is paying attention. There is no chance the Southwest Chief will be killed. The much larger point is that Amtrak should be run by someone who wakes up every day asking how he can increase service nationwide. Even if he isn’t all that successful, his heart will be in the right place and Amtrak will be marching forward instead of crawling backward. Let’s look at the crazy, dangerous Southwest Chief plan proposed by Anderson. Bus service between Dodge City, Kan., and Albuquerque, N.M., would be much longer than the rail route, ten-plus hours of winding two-lane roads that would be extremely dangerous in winter storms. This is opposed to a six-plus-hour rail trip that is good in all sorts of weather. As I said, Congress won’t let that happen, but everyone should look out for dirty tricks such as elimination of sleeping cars (which would be eliminated on either side of the bus bridge plan, even overnight). Congress should slap that down if Amtrak tries it. Amtrak should never be allowed to dumb down service, although it is nibbling at the edges. Those strange box meals being served on the Chicago–Washington and Chicago–New York–Boston trains will probably spread elsewhere unless passenger advocacy groups scream loudly and often. Let’s suppose Anderson somehow manages to kill all (or most) long-distance trains. Members of Congress make clear that if their train is eliminated, they won’t vote to fund the Northeast Corridor. Worse, the corridor would have to absorb the joint expenses from the abandoned routes, and corridor financial losses would skyrocket. As I said, it won’t happen. At least I don’t think it would happen. It all begs the question, Where is Amtrak’s board of directors in all of this? Why are they allowing it to happen? I may cover that in a later column. What might Anderson do next? First, let’s look at what he has done, starting with making an enemy of the U.S. Marine Corps. At the last minute, with no explanation, Anderson canceled the annual special “Toys for Tots” charity train that operates on a non-Amtrak route in central New York State using many Amtrak employees who volunteer their time. The Marines asked Anderson to reconsider. A lot of toys and clothing won’t be delivered, a lot of poor kids will be disappointed, and the Marines are angry. Typical of a Grinch, Anderson doesn’t seem to care. Reps. Paul Tonko (D-N.Y.), John Faso (R-N.Y.), and Elise Stefanik (R-N.Y.) wrote Anderson to request that Amtrak reconsider the new guidelines that would prevent the Toys for Tots train from making its annual trip. “We are aware that Amtrak has established a new policy for the operation of charter trains and believe it has every right to do so. However, ending this important holiday charter service will negatively affect the neediest in our communities and discontinue a positive charitable action that has brought great recognition to Amtrak’s reputation in the eyes of many,” the letter said. According to a press release issued by Tonko’s office, the new guidelines require that charter trains must operate on existing Amtrak routes; must not be one-time trips; must generate sufficient financial benefit for Amtrak to justify the use of its resources and assets; and are subject to a final written agreement signed by Amtrak and the commercial carrier customer. “This holiday season would mark the 20th year of this longstanding and generous service. We have been deeply moved by the spirit of community and love for our children that are expressed through this program, and we sincerely hope that the tremendous good it does will not be lost this holiday season,” the lawmakers wrote. As we go to press, Anderson was unresponsive. The Marines and lawmakers are not the only enemies that Anderson has made. Private car owners are angry that he put lots of new restrictions on their movements. Not only does this affect moves on regular Amtrak routes, but also positioning moves for private excursions off the national system. Believe it or not, Anderson decided to rub it in by declaring that passengers cannot ride on the back of open platform cars at speed. If I was a private car owner, I’d stuff as many riders as safely possible on the back platform and dare Anderson to take action against me. The American Association of Private Railroad Car Owners, is not without political power, and should use it to its advantage to relax some of these arbitrary policy decisions. In keeping with Anderson’s lack of knowledge, he doesn’t seem to know that three routes in California are independent and make their own decisions. Without telling anyone, Anderson decided to kill a variety of special fares on those routes. The California officials who control those routes quickly told him that he can’t do that. What’s more, they explained experience shows that the then-upcoming period of time around January needs those special fares to fill seats. Otherwise, the trains would lose even more money than usual. Anderson doesn’t seem to listen to anyone. He makes nutty plans and doesn’t seem to care what anyone thinks. Believe it or not, Anderson still doesn’t talk to reporters, and he gets angry and stomps away if he discovers he is chatting with a member of the media. That is frustrating even to his own press people, but there’s nothing they can do. One reporter recently talked to anyone he could find at Amtrak and printed the results. No one at Amtrak called him to complain, but a top official (not Anderson) called a sympathetic newsletter to say he got everything wrong. As word spread about what the top official said, a lively debate ensued about what he meant. There was no way to tell. He left too many possibilities open. Notice that all the problems above would disappear if Anderson was dumped and a responsible person was named to succeed him. The Toys for Tots train would run as it usually does. Private cars would operate as they used to, and owners and guests could ride on the back platform. Full-service dining cars would return as soon as possible to trains in the East. Amtrak and the states would cooperate on expanded services. Amtrak would have a good relationship with Congress. Amtrak’s press people would start smiling again. 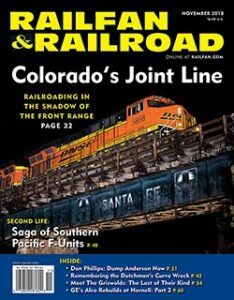 Read the rest of this article in the November 2018 issue of Railfan & Railroad!